The BHS offers several different categories of membership. The membership year runs from May through to the following April and those joining between January and April may pay half of the current membership fee, or choose to pay the full figure and receive the current year's back issues of Journals and Newsletters. Individual membership costs � per annum, or � pa for the unwaged or retired. Corporate membership costs � pa and includes four copies of each issue of the Journal and Newsletter. RCB membership (aimed at the smaller brewery) costs � pa and includes two copies of each issue of the Journal and Newsletter. Overseas membership costs � pa individual, payable in sterling please. Or email membership@breweryhistory.com for further information, including alternative methods of payment. What do you get when you join the BHS? The new member pack contains enough reading to keep you absorbed for quite some time. 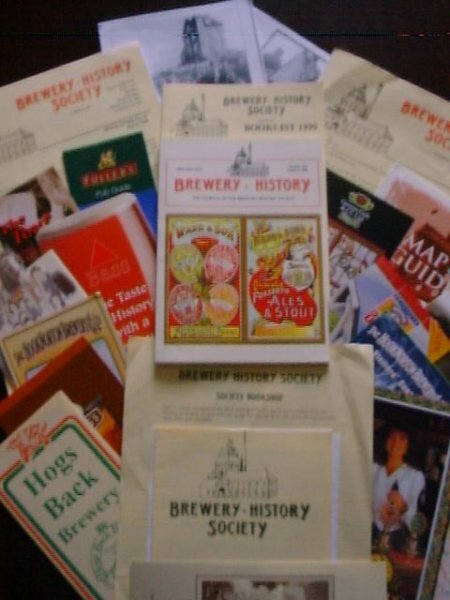 It includes copies of each Journal and Newsletter issued so far this membership year, a membership card, the current bookshop listing with details of many hundreds of books for sale, a number of flyers for BHS publications and a range of leaflets from breweries. In addition to the AGM the Society holds regular Corporate Member meetings. These are hosted by our Corporate Members and are open to all Society members, they are not gatherings solely for our Corporate Members! They typically involve a tour of the brewery, often more in depth than any public tour on offer, and a talk related to the history of the company. We also hold a number of local, lower key, brewery visits and meetings throughout the year. Whenever a brewery is threatened with closure we try to visit to record what we can for posterity. Apart from breweries we also research and visit other related enterprises such as maltings. Above all it's about enjoying ourselves. Please do join us.